I have a tendency to be a hair-on-fire kind of person. I like to be busy, have a project or two going, read a couple books at the same time. I like to have fun, I like to be productive. I get bored easily. And I LOVE to relax. I love to sit on my deck and just watch the wind move the branches in the trees. I like naps. But mostly? I like to do stuff. I sew, knit, cook, try to build things out of wood, speak publicly, and write. So, how does all this work with a 13-year-old daughter with special needs? My daughter, Natalie, is very cute both in appearance and personality. She is also sweet, determined, generous, funny, bossy, loving and talkative. She has hypotonia, sensory processing dysfunction, is fed through a tube, has cognitive impairment, and visual-spatial struggles. Her needs require a parent with time. Natalie cannot be hurried. It just isn’t possible. She decides slowly, walks slowly, thinks slowly, speaks slowly. At the same time, she definitely knows what she wants and where she is going! Just ask her! But give her time to answer. The fastest way to shut her down is to ask three questions in a row, which is what most people do. When she doesn’t immediately answer the first question, people often assume they need to ask another, or offer an answer. Not true. She just needs time and patience. To really connect with Natalie, I have to slow down from my tendency to run around with my hair on fire. My joy bubbles up when I slow down and spend time with her, listening to her, watching her. Her eyes sparkle. She doesn’t worry the way the rest of us do. She lives in the present. When I live at mach 10, I am rarely living in the present moment. I am usually trying to prepare for some time or some event in the future. The present moment is reality. The past is over, the future has not yet arrived. I am much happier, more content, more at peace when I am in reality, in the present moment. Otherwise, I hurry through the smiles, the joy, the stories. Natalie is open in a way many people are not. She is without guile, sharing so truthfully and openly. She doesn’t have the safety filters we so often employ to protect our images. When I live at her speed, I participate in the uncommon privilege of who she really is because she doesn’t edit herself. Just this morning she told me she was sick of me! I don’t enjoy that part, but I know she is being honest. She is frustrated with me because I say no sometimes. If I am not paying attention to my REAL priorities, if I have ramped back up to mach 10, her words can annoy me. Mostly, though, I love it. 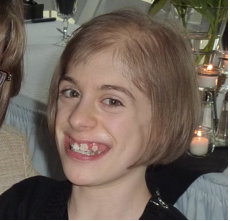 The very best thing about having a child with special needs is that it slows my pace of life. I get to sit with her at night before she goes to sleep and hear her slowly unfold the events of her day. She likes to use words she has heard, ask what they mean and try to use them correctly. Tonight she said, describing events with a classmate in school, “Mom, technically, you know. Technically, the thing is, that um, well. I show her the picture and technically she does the sign language for it. Because that is her job. The technical part of it. I show her the picture and she does that. She is learning the colors of the rainbow, like red, pink, orange, yellow, green, blue, violet, purple.” She repeated all that again before telling me about gym class. Slowing down to listen, I get to watch her while she talks, to see the emotion behind the words, to see her sweetness or anger and not just rush through it all, only hearing the words. I cannot live a fast-paced life. I cannot rush her to the car, or anywhere else. In that slowed time, that more reasonable way to live, I can actually know my daughter. I get to hear her heart. She has such compassion for other kids. She loves to help other kids. So I slow down to her speed of doing life. And it is a sweet speed. I mean that. The breakneck speed of life I usually live isn’t really friendly. I might enjoy it, but it isn’t probably good for me. I end up hurrying through life and hurrying others through life as well. So I consciously make the choice to slow down and live at Natalie-speed. Natalie-speed allows me to watch the tree branches move in the breeze. It allows me to see the joy in my beautiful daughter when she talks to her stuffed-dog, and answers for it too. Natalie-speed enables me to live a life that keeps my priorities in order. People first. My family first. Everything else comes after that. And I like it. Lynn Rickert is the mother of five kids, and she owns and authors PedalingBackwards, a blog about life with her daughter Natalie, who has special needs and is tube fed.